Our Optic department at Southern Cameras has everything from small binoculars to giant Astronomical telescopes. 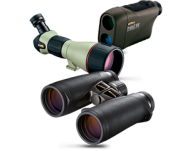 We carry top binocular brands like Pentax, Steiner, Leica, Swarovski & Zeiss. Telescopes from Skywatcher and Meade & Spotting scopes from Konus, Swarovski, Zeiss & Leica. We also have a range of rifle scopes from Nikon, Pentax & Swarovski available. 45°inclined head 360°rotable with the reasonable system for easily viewing Wide field eyepiece..
Sharp stereo erect image over a vide field view .• 45° inclined and 360° rtational binocular head..